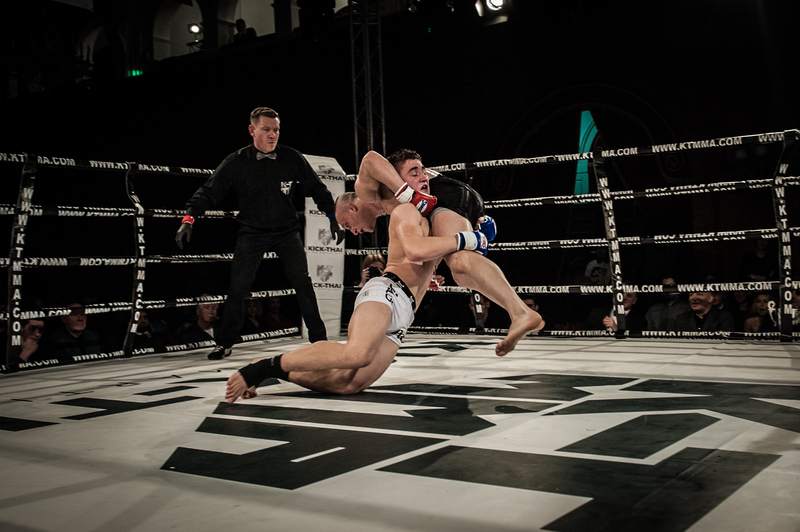 After his spectacular debut on the first ever KTMMA event last November, Regis ‘The First’ Sugden went two for two with yet another outstanding performance on Saturday 1 March. The 18 year-old from Suggy’s Gym entered the ring at the Portland Hall in London with a pro record of six wins in six fights, three by knockout. He emerged with his record intact after the two five-minute rounds, beating Theo ‘300’ Michailidis from KO Bloodline gym by a unanimous decision. On paper Regis was the underdog, facing a bigger and more experienced MMA opponent with a pro record of four wins and two losses. But being well known for his stand up skills, he was widely fancied to do well in the first round, fought under K1 rules with elbows, and it came as no surprise when he dominated it with some superb striking. Despite Theo’s aggressive approach, Regis was calm and clinical, catching his opponent with his trademark spinning back kicks. Theo walked through everything until the final 10 seconds of the round when Regis followed up a barrage of punches and a spinning hook kick which wobbled his opponent, leaving him sitting on the bottom rope and saved only by the bell. As the second round began, under MMA rules, the audience was expecting a tough time for Regis but he remained unfazed and used his striking to good effect. The two fighters were looking for a takedown and both scored one each during the round. Theo kept pushing for a takedown but Regis was able to prevent it, even though both fighters ended up on the ground for a time. Regis found a way to get back to his feet, showing tremendous resilience as elbows and knees were raining in, and continued to land some heavy blows. Theo landed an illegal knee to the top of Regis’s head, not once but three times in succession, which resulted in a point deduction. At the final bell, Regis’s felt confident their man had done more than enough to take the fight, irrespective of the point deduction, and he was duly declared the unanimous winner by all three judges.